Word-Filled Wednesday....At Laced With Grace! Laced with Grace Fall Giveaway! I love the book of Esther. In this passage, Esther had just learned about Haman's plan (and the King's involvement) to annihilate the Jewish people. Esther, the Queen, was a Jew, but had kept this secret. No one, except her uncle Mordecai, also a Jew, knows her secret. Mordecai comes to Esther, asking for her help as Queen. He asks that she go into the King's presence to beg for mercy for her people. This may not sound like a big deal, but it was against the law to come into the King's presence without first being invited. And, the punishment is DEATH! The only exception is if the King extends his golden scepter to the person. When Esther reminds Mordecai of this, he wisely reminds her that the Jews are God's people. God will deliver them, one way or another. But, how do you know Esther that THIS isn't the reason you are here in the first place? 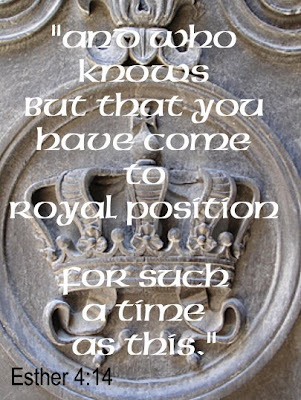 Is it possible, Esther that God has placed you in the palace for exactly this purpose? For such a time as this? Well, we find out that God has placed Esther there for this purpose and saves the Jewish people through her. Esther is a reminder to us of God's Sovereignty. God works through our circumstances and has a plan and purpose for us. I love Esther because it reminds us, that we too are here, on planet earth at this time, in this generation ON PURPOSE. God is working through us to accomplish all that He needs to accomplish right here, right now. It is not an accident that you are living where you are, when you are. God has a plan for you in this generation. So...who knows but that you have come to your position for such a time as this? It's not that I haven't tried. An endless "to do" list. And, a computer that hasn't cooperated much!!!! I was rushing to pick up my 8th grader from football practice, a little frantic to get there "on time", i.e. : he is not the LAST player waiting in the parking lot. As I rounded the corner, I couldn't help but notice the car leaving the school. This mom had a radiant smile beaming from ear to ear. She and her son were talking about something and it looked like they were having FUN. Instantly, it struck me that I wanted to be a radiantly beaming mom, enjoying the company of my son! I want to enjoy my children (while they are children!). I want to have fun with my family. I want my legacy to be a life (and a home) filled with laughter and joy. Now, I confess I can be a bit too serious at times. And, the Holy Spirit has been quieting me when my first reaction is to nag or complain. I am learning to close my mouth and listen more "quickly." I am trying to live out James 4:11: Be quick to listen, slow to speak, and slow to get angry. Why is it that we sometimes think we are NOT supposed to be "happy" as Christians? There is so much dispute between "happiness" and "joy." I have heard people say something like, "Joy is within in our spirits, while happiness relies on our circumstances," as if there is something wrong with "happiness." Maybe you've heard the same things, and have even felt guilty because you are happy. And, even though we can't be "happy" all the time, 24/7, we can experience happiness regularly. Remember the mom with the beaming smile? She was GENUINELY enjoying herself!I believe God wants us to be happy....enjoying life. Jesus had a great sense of humor, and I find myself laughing at loud at times reading some of His parables. He said that He came to give us ABUNDANT life...life to the full. I know PERSONALLY what a sense of humor God has. Why else would He give me a husband that is so DIFFERENT from me, but children who are exactly LIKE me? I know so He can get a good laugh at the "fireworks" sometimes! While "happiness" may be fleeting, and can depend on our circumstances, joy comes from who we are in Him. No matter what is happening in our lives, we still experience the joy of being His, knowing that He is getting us through, holding our hand. Jesus tells us to "remain in His love so that His joy may be in us and that our joy may be complete." Paul, who should have been the most depressed and unhappy person according to his circumstances- beaten, stoned, imprisoned, and shipwrecked twice- was full of BOUNDLESS JOY- he said "in all my troubles my joy knows no bounds." He says, "In spite of severe suffering, you welcomed the message with the joy given by the Holy Spirit." When he and Silas are praying and singing in jail and the chains fall off, I can't picture a man who is sad, but full of praise for His God! Paul prays for us, "May the God of hope fill you with all JOY..." Peter tells us that even though we haven't seen Jesus, we love Him and believe in Him and are "filled with an INEXPRESSIBLE AND GLORIOUS JOY." John tells us that through our fellowship with Father and with the Son our joy is complete. But, what about "happiness?" Is it OK to be happy?Proverbs 17:22 says, "A happy (cheerful) heart is good medicine." Psalm 128 says, "Blessed (happy, fortunate) is everyone who fears, worships the Lord, who walks in His ways and lives according to His Word. For you shall eat the fruit of the labor of your hands; happy (blessed) shall you be, and it shall be well with you." When we are walking in a RELATIONSHIP with the Lord we experience happiness. Psalm 144 says, "Happy and blessed are the people (who trust in God) who are in such a case; yes, happy are the people whose God is the Lord!" When we TRUST God, we experience happiness. Psalm 146 says, "Happy (blessed) is he who has the God of Jacob for his help, whose hope is in the Lord his God." When I put my hope in GOD, when I go to Him for help, I experience happiness. A synonym of "happy" is contentment. Paul says "I have learned to be content whatever the circumstances. I know what it is like to be in need, and I know what it is like to have plenty. I have learned the secret of being content in any and every situation, whether well fed or hungry, whether living in plenty or in want. I can do all things through Christ who strengthens me. "Again, this contentment comes from a relationship with Jesus...depending on His strength.We don't always "feel" happy, but we can turn our thinking around! What makes you happy? A child's smile? Talking to a friend? A beautiful sky with puffy white clouds? A flower arrangement? What about making a craft for a neighbor and sharing happiness with someone else? Philippians tells us, "whatever is true, whatever is noble, whatever is right, whatever is lovely, whatever is admirable- if anything is excellent or praiseworthy- think about such things. "We need to teach our children, and live by example, to enjoy everyday life, to have fun together, and to laugh. We must teach them that as Christians, we can experience true JOY no matter what our circumstances are. Even in sad times, even in grief, we still have joy in the Lord and who we are in Christ. Mother Theresa said, "Joy is prayer. Joy is strength. Joy is love. Joy is a net of love by which you can catch souls. God loves a cheerful giver. One gives most who gives with joy. The best way to show our gratitude to God and people is to accept everything with joy. A joyful heart is the normal result of a heart burning with love. Never let anything so fill you with sorrow as to make you forget the joy of Christ risen. This I tell you my sisters. This I tell you." Why do you think it is important to experience joy, happiness, and contentment as a Christian? How can you create a home filled with laughter and joy? Please allow the Holy Spirit to speak to your heart about joy and happiness. Quiet your heart, allowing God to show you areas in your life where He wants to renew your mind. Please join in the discussion At the Well. Write about what God is showing you and link back here. We would be so encouraged to hear your thoughts and what you have learned. Giggle. Giggle. Wink. Wink. Giggle. As I begin to make my well to a fresh drink of the Living Water of God, my cell phone rings. I stop to see who is calling. As I turn, I hear the "ping" of a new email message on my computer. And, as Jesus beckons me to come, the annoying buzz of a text message steals my attention. Technology is wonderful, isn't it? But, I have found that I must be very careful how I use it- in many ways- but especially that it doesn't steal my time. How many of us have intended to only spend a few minutes at the computer to check our email when we realize we have just wasted an hour from our day! As we read Titus 2, we see that we are to be "busy at home". And, as I read Proverbs 31, I want to be that Godly woman, industrious at home, taking care of her family. So, I have found that I must be alert, aware, and careful how much TIME I am spending on the computer. It is a wonderful resource of recipes, advice, and housecleaning tips. But, I have a shelf of wonderful cookbooks, "tried and true", that I can just as easily open for inspiration. One thing that I want to remember as well is to seek the advice, when needed, of Godly women "IRL"- my mother, my mother-in-law, and my spiritual mom. It's strange because I can go several days (sometimes a week or longer!) and realize that I haven't talked to my mom! We live several hours away from one another, so it is important to call on a regular basis. Email is fast and easy when we need to "get the information out." But, we must not depend on it solely. There are people in our lives that need a loving touch.....a personal phone call, a letter, and even a VISIT! This happened to me recently. I received an email asking if anyone knew a Christian woman providing daycare. I knew a childcare provider who (I thought) had openings. I was tempted to just email my response, but was prompted by the Holy Spirit to pick up the phone and call her. What I found was that she wasn't even doing childcare anymore due to health concerns and that she needed a FRIEND! I was able to talk to her and PRAY with her and make a plan to help her with HER KIDS! That never would have happened if I would simply have just emailed her name and number. But, I will instead encourage you to join the discussion At the Well where there are other Godly women sharing their wisdom on this new Cyber-world we live in! And, if you would like to join in the discussion, please do! Here are the topic questions. Please click on to link up to others At the Well. What is a "Titus 2?" With the world of Technology growing by leaps and bounds, a majority of our communication takes place via email, blogging, twittering, facebooking etc... How can we make sure that we are living out Titus 2 in the cyber world so that the Word of God is not disgraced? How do we keep a balance between grace and hard Truth? This is an awesome memorial video on youtube. Please take a few minutes today to pray for our country and 911 survivors and families. 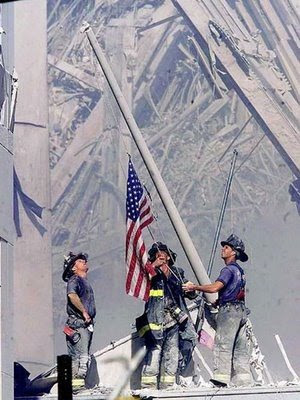 Many brave men and women gave their lives trying to save others that day. This was an attack on freedom. Take a few minutes and remember where you were that day. Pray, pray, pray for our beautiful country. Freedom and liberty are again under attack in this country. Pray that we would again return to the Lord. Pray that we would seek God in all that we do. Pray for a spirit of repentance. Pray for Truth to shine through the darkness. Jesus said that what was once whispered in the dark would be shouted from the rooftops. Cry out to our Mighty, Merciful, Loving, Patient God. Oh, how I long to be described as "a display of His splendor"! How I want others to see Christ in me! This is the cry of my heart! Please visit me at Laced with Grace today to read the devotion that goes along with my WFW! Click here! And, please visit the AWESOME Lori at All You Have to Give to link to more inspiring WFW! There is a new giveaway over at Laced With Grace! http://lacedwithgrace.com/wp-content/uploads/2009/09/Fall-2009-Giveaway_400.jpg"
Isn't this an AWESOME giveaway???? Hop on over to Laced with Grace for your chance to win! Hope you don't mind.....I am reposting this from last April. I have been thinking about this verse recently. and because I want to "get it out of the way"
Thank You, Holy Spirit that You have been quieting my heart and hushing my mouth and opening my eyes to this "bad habit." 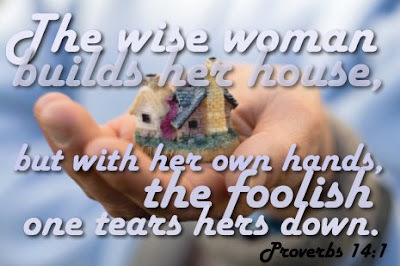 I want to be the wise woman who builds her house!